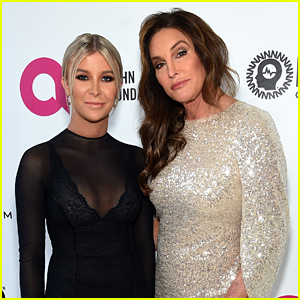 Caitlyn Jenner and Sophia Hutchins step out for the Elton John AIDS Foundation Academy Awards Viewing Party! The 69-year-old Keeping Up with the Kardashians star and her friend attended the event held on Sunday (February 24) in Los Angeles. They were joined by Brody Jenner, Lisa Rinna, Harry Hamlin, Pose’s Angel Bismark Curiel, and producers Janet Mock and Our Lady J.
Caitlyn wore a sparkling mini dress, and Sophia rocked a sheer black dress. FYI: Caitlyn is wearing a Badgley Mischka dress and Barolo shoes. Brody is wearing Stitched, and his wife Kaitlynn is wearing Silvia Tcherassi with Joy Reign jewelry. Lisa is wearing a Balmain dress, Tom Ford shoes, a Bulgari watch, Siena Jewelry, and an Emanuel Ungaro clutch. Janet is wearing a Vivienne Westwood dress, Christian Louboutin shoes, and Gismondi 1754 jewelry. Our Lady J is wearing Brandon Maxwell with an Edie Parker bag. Sophia is wearing a custom August Getty dress with Stuart Weitzman shoes.